Do you still punch holes in your control cabinet? The Murrplastik type KDL/H cable entry system provides entry and lead through for pre-assembled cables. The KDL/H-system is a divisible system that offers easy and quick installation in the control cabinet and clamping box for up to 48 pre-assembled cables with a very high packing density. Are you using molded cables you can't (or don't want to) splice? FPE Automation has samples of this new product on the way! Interested? Contact your FPE solution specialist. With Omron's Sysmac Starter kits, you get everything you need to begin a project. The core automation components are designed to work together, minimizing integration time and setting a control foundation for future expansion and increased performance. Selecting your Sysmac Solution couldn’t be easier! 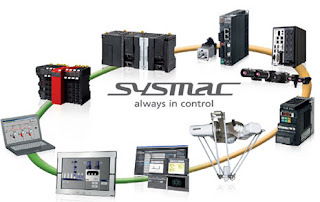 The Starter kits come with Sysmac Studio configuration software, a selection of NJ controllers paired with the NA series HMI, an EtherCat NX I/O module which allows a wide range of I/O to be selected separately, power supplies and communication cables. --- All at a great price! There is a kit for any project! FPE is here to help. Contact us if you'd like to learn more. 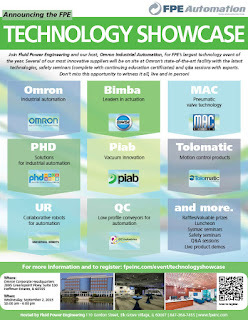 Announcing the FPE Technology Showcase - Save the Date! Join FPE and our host, Omron Industrial Automation on Wednesday, September 2 for FPE’s largest technology event of the year. Several of our most innovative suppliers - Omron, Bimba, MAC, PHD, Piab, Tolomatic, Universal Robots and QC - will all be on site at Omron’s state-of-the-art facility.